I've given you one of my favorite pieces of art. This is a painting by an artist named Anneke Kaai simply called Grace. It can be found in a collection of her art integrated with reflections by Eugene Peterson in the book In a Word: The Image and Language of Faith. Take a look at it. I love this image of God's grace. 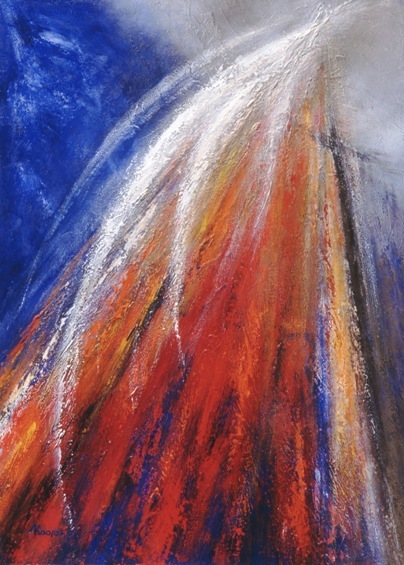 I see an explosion and unceasing flow of light, colour, power, and life mediated by the cross of Christ. See it on the right side next to the gold flow, shadowy but present? If we could see the reality of grace, I think it would look like this, shining and shimmering and flowing over us and around us and into us. This is our atmosphere. Receive it. Breathe it in. Taken from a sermon on Vocation and Grace by Travis S. Hines, Conclusion of “Stewarding our Vocation” preaching series at Christ our Hope Anglican Church, Ft.Collins, CO,Fall, 2014. To listen to the whole sermon, go to http://tinyurl.com/Hines-Vocation-Grace.